A central spot for bears. Terrace, and (small) dance floor in the basement with disco ball. If you is french,1 beer :1,40,but if you accent is stranger...1 beer is 4 or 5. ,no devolution of the change!the people no is estupids..(!!! )the bar is full of scorts .I not recommend! Si eres frances te cobran 3,40 pero en cuanto se dieron cuenta que era español o no te devuelven el cambio o te cobran lo que les da la gana..las dos osas francesas piensan que somos idiotas..Ademas esta lleno de escorts y chaperos.no lo recomiendo. i am DISGUSTED and embarrassed that this is affiliated with the gay community. This is the only bar that I have ever been to where I was denied service based on the gender of the people in my group. The manager blatantly said in french, and in english "this is a bar for men only, you cannot be here", because there were two girls with us. I would never ever recommend this bar to anyone, i am so ashamed and hope that people to associate people who act like that with the gay community. 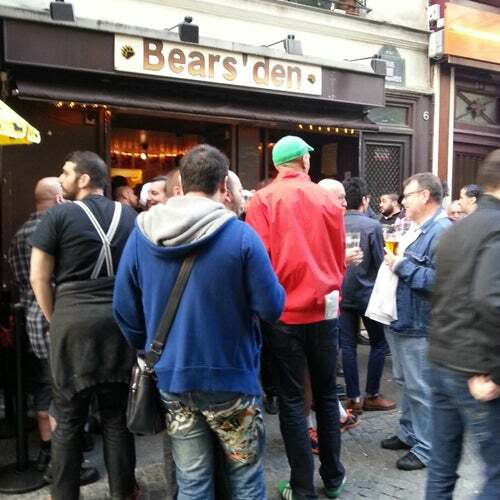 Definitely the place for the bear crowd and it's admirers. A good place to go even if you are not drinking: stay outside and enjoy the view. Best on Fri-Sat-Sun. Not too much activity during the week. Check the Happy Hours: drinks at half price (usually until 21h). Small dance floor and a backroom (very busy sometimes). I wonder why every bear bar are so narrow?? Tres sympa. A ne pas rater. So I'm a bear. I love the Bear's Den. Bias alert! For regular guys, attitude-free chat, carnal fun downstairs, and good scenery, this place offers the best in the area. On any night of the week, I never fail to meet nice men and rough up a little fur. WOOF!